If I recall correctly, I added this book to my TBR list a couple of years ago. It was therefore something of a surprise when I started reading the book and realised that I either had never noticed or had forgotten what the structure of this book was. 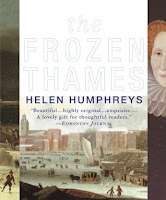 Rather than a through narrative following a set of characters, The Frozen Thames is a series of vignettes with each being set at a different year when the winter was so cold that the river Thames froze over. Each of the forty different stories is perhaps three or four pages long, certainly not many were much longer, and so just give a glimpse of life at a particular moment in time. When you have forty or so short stories some will be stronger than others and that is definitely the case here, but what you do get is some fascinating glimpses of these particular moments in time. The first story is set in 1195 and is about Empress Matilda, would be queen of England. She is in a castle on the banks of the Thames, besieged by the forces of her cousin, King Stephen when she manages to escape during a blizzard by dressing all in white and crossing the frozen Thames. Now, if you didn't know that this was a true story and I hadn't read of it in books by authors such as Elizabeth Chadwick and Sharon Kay Penman, it is possible that you would think that it was a fanciful piece of writing! Truth is sometimes stranger than fiction. At other times the frozen river became home to frost fairs, something which turned out to be a great social leveller as both the higher levels of society and the lower classes all took advantage of the unusual conditions to linger on the ice. I recently read about one of these frost fairs in The Gilded Lily by Deborah Swift and so it was fun to see more about these. Of course, for all the fun of the frost fairs there are also the ferrymen, porters and others who rely on the river for their livelihood who are affected as well and their story is not forgotten either. I liked the fact that there was a mix of social classes through the stories as well. We saw young boys waiting for the King's carriage to drive past them on the ice and the pub owner's who have an iced-in boat tied to their pub. There were even two stories that were linked which I loved. A young woman takes a risk crossing the river as it started to melt and then her grown child has to face his fears in a later story. Along the way, the author skates (pun intended) through history, touching on things like the hearth taxes and window taxes, the plagues that caused such death, and more. As an object, this is a beautiful book. It is a small volume, with thick paper and the text is interspersed with some pictures from the relevant eras which made it a joy to look at. In some ways, it is a shame that it is highly unlikely that the Thames will freeze again, thanks mainly to the fact that the bridges across the river have such wide spans now, along with the other man made interventions such as the embankments, and global warming. Then again, when I read this it was a more than 40 degrees celsius day so I was reading to help myself feel cooler. Now, as I finish off this review, I am watching the news about more flooding in Queensland and New South Wales where homes and lives are being destroyed and lives lost so it is best that we don't wish for those kinds of extreme weather conditions. It is hard enough to deal with when they come without wishing for more. In its long history, the river Thames has frozen solid forty times. These are the stories of that frozen river. So begins this breathtaking and original work, which contains forty vignettes based on events that actually took place each time the historic Thames froze solid. Spanning more than seven centuries—from 1142 to 1895—and illustrated with stunning full-color period art,The Frozen Thames is an achingly beautiful feat of the imagination…a work of fiction that transports us back through history to cast us as intimate observers of unforgettable moments in time. Whether we’re viewing the magnificent spectacle of King Henry VIII riding across the ice highway (while plotting to rid himself of his second wife) or participating in a joyous Frost Fair on the ice, joining lovers meeting on the frozen river during the plague years or coming upon the sight of a massive ship frozen into the Thames…these unforgettable stories are a triumph of the imagination as well as a moving meditation on love, loss, and the transformative powers of nature. I loved your review! I requested it through iil Loan at my Library. This sounds like an excellent book, and one that would be really intriguing for a historical fiction lover like me. Thanks for giving us your unique perspective on this one today, Marg! It is an interesting, and quick, read! I read this a few years ago and I too really enjoyed it. I loved all the little stories and I don't normally like short stories. I agree on the book too - it is beautiful. I'm glad you enjoyed it. It is a beautiful object in itself! I think I'd like this one! Thanks for reviewing it - may have bypassed me otherwise. What a fun concept! I too really like the idea of frozen rivers and big winter fairs - I think they still have those in Russia, don't they?